Anthropologists in Borneo observed a rare instance of a female and a male orangutan teaming up—to kill another female orangutan. 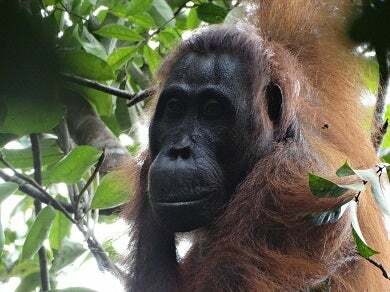 This is the first observed time a female-female conflict in orangutans has turned lethal, and the way the it went down changes what we thought we knew about orangutan behaviour. Primates attack each other fairly often but an attack reported in the journal Behavioral Ecology and Sociobiology changed what we know about one particular type of primate. Anthropologist Anna Marzec, from the University of Zurich in Switzerland, describes the incident which took place in the Mawas Reserve in Indonesia. It sounds pretty grisly. The fight was instigated by a female named Kondor. Kondor had some issues with an older orangutan female Sidony (pictured to the left), who had hit and bit Kondor when Kondor approached Sidony’s daughter. Kondor, who had no dependent children at the time of the fight, had been hanging out with Ekko, a young male. Just before the fight started, Ekko had gone to “sexually inspect” Sidony but had gone back to mate with Kondor. Kondor broke off the mating, ran over to Sidony, and started attacking her. The fight developed into something more than just a few bites or hits. When Sidony tried to get away, Ekko blocked her path. When Kondor stopped attacking, Ekko started. For 33 minutes, the two took turns beating and biting Sidony — with Ekko inflicting more damage due to his larger canines. Then things got even weirder. The fight might have gone on longer, but another male, Guapo, jumped into the fight and chased Ekko away. He did not chase Kondor away, although he alternately helped Sidony get away and pushed himself between the females when Kondor subsequently attacked Sidony. Sidony mated with Guapo during this time. Though Guapo did provide protection from Kondor, Sidony’s existing injuries were too extensive. She weakened steadily and died two weeks later. Orangutans are relatively solitary. Females and males almost never interact unless it’s time to mate — not surprising, since the researchers describe mating as often due to “coercion”. Orangutans are also “philopatric”, meaning female relatives will settle close enough that their ranges overlap, but they rarely form tribes or groups. Males sometimes get into serious fights, but the fact that females can get into lethal fights is big news, even if it is one incident.